NXT is about to step into the spotlight on the grandest virtual stage of them all. On Thursday, 2K announced details regarding the upcoming release of the collectible NXT Edition of WWE 2K17. The limited edition version – of which only 50,000 copies will be made available worldwide – will shine a spotlight on NXT, the WWE global brand whose presence in WWE video games has grown substantially in recent years. The NXT Edition of WWE 2K17 will offer grappling gamers a wide variety of exclusive features, from in-game enhancements to collectible WWE memorabilia. the NXT Enhancement Pack, which includes three playable NXT Superstars (Shinsuke Nakamura, Nia Jax and Apollo Crews) as well as a 50-percent point bonus at NXT in WWE 2K17’s MyCareer mode;an exclusive Canvas 2 Canvas lithograph designed by WWE portrait artist Rob Schamberger and autographed by NXT Superstar Shinsuke Nakamura;an exclusive eight-inch “Demon” Finn Bálor collectible figurine;an exclusive Topps NXT TakeOver: London Mat Relics Card, which will feature one of the Superstars who competed that night as well as an authentic piece of the event’s ring canvas; andaccess to all features available in the WWE 2K17 Pre-Order Bonus, including the availability of Goldberg as a playable character. 2K will present these exclusive items in specially designed NXT packaging to house the NXT Edition of WWE 2K17. This creative touch echoes 2K’s recent reveal of the official WWE 2K17 and the announcement of Brock Lesnar as the game’s featured WWE Superstar. WWE 2K17 is not yet rated by the ESRB and is currently scheduled for worldwide release on Oct. 11, 2016, on PlayStation 4 and Xbox One as well as PlayStation 3 and Xbox 360. Triple H conducted an interview after NXT TakeOver where he gives an in site on the future of NXT in which he mentions Nia Jax and the Women’s division. Here is a brief synopsis on the comment. Full interview below. May 29th is officially here which means it’s Nia’s birthday! 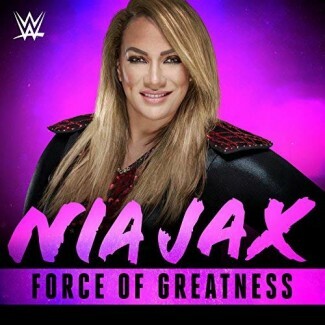 A few weeks ago NiaJax.com announced Nia’s birthday project. It’s no surprise Nia has not only made an impact on the NXT roster but also in the lives of her fans. So we put together a project to allow all of you the chance to wish Nia a Happy Birthday as well as tell how she has inspired you! We would like to thank Rain for helping us design Nia’s T-shirt as well as our staff member, David for helping put together the birthday video! Read all of the birthday messages below. 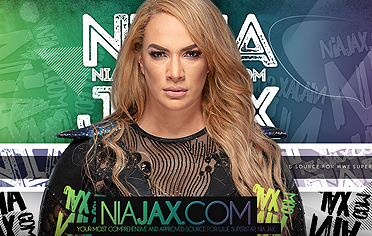 What will happen when Bayley and Nia Jax square off for the first time since their brutal showdown in London? Find out on WWE NXT, this Wednesday at 8/7 C, only on WWE Network! Bayley’s road to reclaiming the NXT Women’s Championship takes a slight detour this Wednesday as she rekindles her rivalry with the powerful Nia Jax on WWE Network. The two clashed this past winter over the title, engaging in a heated rivalry that only intensified after Jax recklessly hurled Bayley through a backstage door. The resilient Bayley emerged from the rubble and stood up to the towering Jax at TakeOver: London, forcing her to tap out to a guillotine submission. A lot has changed since their December showdown, though. Bayley is no longer the champion after a devastating run-in with Asuka in Dallas, while Jax has been keeping a close eye on The Empress of Tomorrow and the title around her waist. A win for either Superstar would make a compelling case for them to be next in line to challenge Asuka. Who will be victorious in this huge rematch? Find out on WWE NXT, this Wednesday at 8/7 C, only on WWE Network! 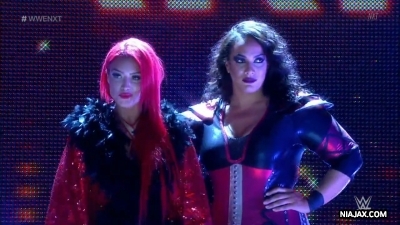 Eva Marie recently spoke with CraveOnline.com, where she discussed her pairing with Nia Jax. Read below to see what she had to say. On Her Pairing With Nia Jax: I think we’re a dominant tag team. There’s nothing really like that on the main roster or in NXT. It was weird how it came about because my first match back on live events in NXT, was with her. I think it was on accident. It was a random pairing because I had just started back wrestling. We had to tag together and she and I were like, ‘Damn. I like this. This can work.’ Then the writers and producers saw it and ran with it and I’m happy they did. I love her and we get along very well and have a lot of the same interests. She’s extremely hard working and we push each other. There’s nothing like being able to work with someone you enjoy and brings out the best in you. Two weeks ago, NXT Women’s Champion Bayley and her best friend, Carmella, battled in a hard-fought title match that saw Bayley successfully defend her championship. There were no hard feelings after the contest, as the two embraced in a show of sportsmanship and friendship. However, the celebration was cut short when Eva Marie & Nia Jax ambushed The Princess of Staten Island at ringside. After attacking Bayley, Nia crushed Carmella with a series of devastating leg drops back in the ring. The carnage was brought to a screeching halt when Asuka chased off Eva and her towering cohort. The NXT Women’s Champion and her best friend haven’t forgotten what went down that night, and they’ll be out for payback when they take on Eva Marie & Nia Jax in a tag team showdown. Don’t miss a second of the action on WWE NXT, this Wednesday at 8/7 C, only on WWE Network!